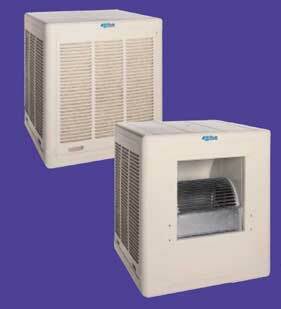 These residential coolers have set the standards for evaporative coolers for over 50 years. And now with 50% thicker pads, we have raised those standards. 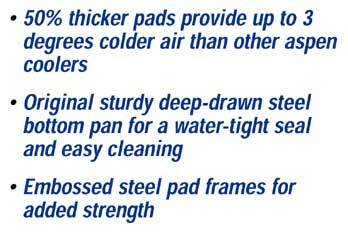 Thicker, denser pads have more evaporative surface area, hold their shape longer for more consistent cooling, and provide up to 3 degrees colder temperatures than standard pads. Environmentally friendly, with no ozone-depleting CFC's, these coolers also add needed moisture to to your home and act as effective "air washers" to help filter out pollutants allowingonly cool, fresh air into your home, greenhouse, or sunroom. Down discharge models are typically installed on a roof while side discharge models are installed on a roof while side discharge models are installed on a roof or through a side wall. Most installations include connection to a duct system to provide cooling throughout the house. 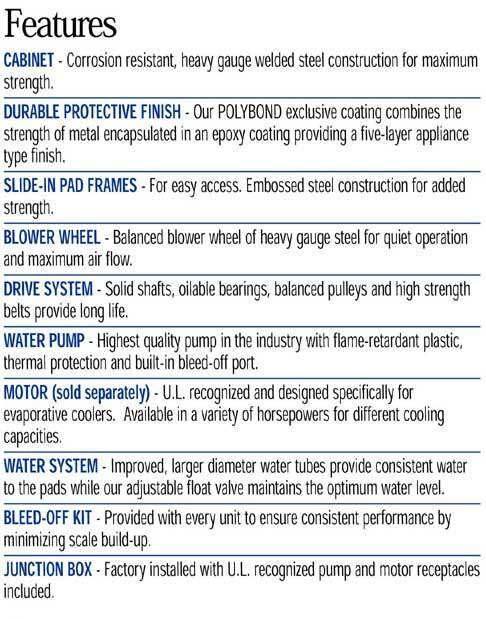 And because our Premium Evaporative Coolers use low horsepower motors, they cost much less to operate than expensive high horsepower refrigerated air conditioning - often saving up to 75% of the cost of operating air conditioning.